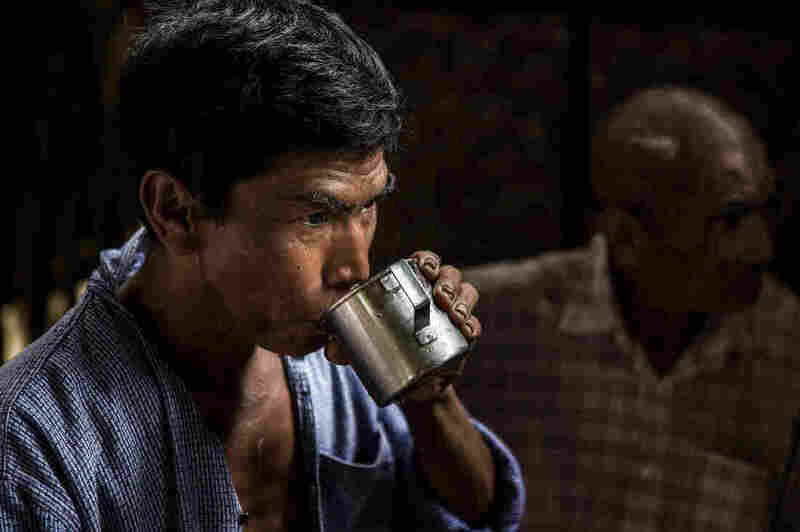 The Biblical Curse Of Leprosy Persists, With 200,000 New Cases A Year : Goats and Soda In 2006, the World Health Organization issued a report on the "elimination of leprosy as a public health problem." A new report estimates there are still 200,000 new cases a year. 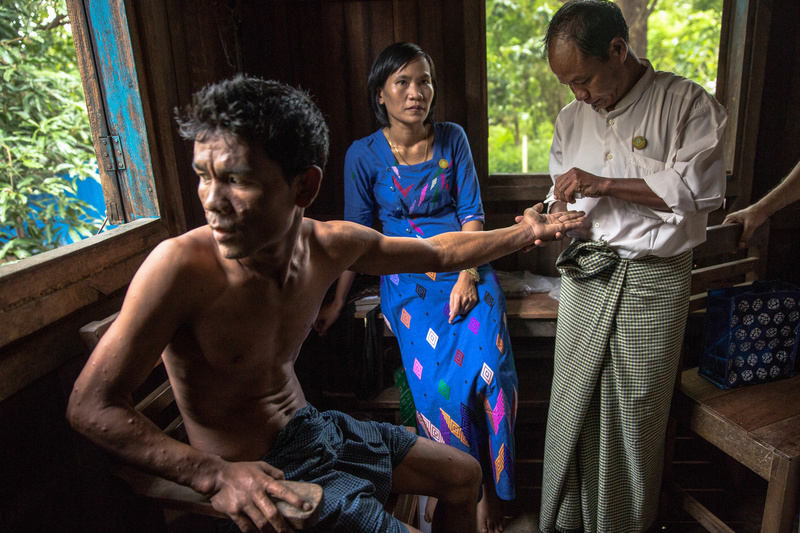 This 26-year-old man in the town of Min Hla in Myanmar has leprosy. Health care workers touch his skin with a napkin to see whether he feels it — a way to determine nerve damage. Leprosy is an ancient disease, a biblical curse and, even in the 21st century, a cultural shame so severe that in some countries, patients are sent to live in isolated colonies or tossed out of their own homes. "I met a woman whose husband and children forced her to live in the cow shed," says Gareth Shrubshole, programs and advocacy officer at the Leprosy Mission. "Her boys refused to share a meal with their own mother." That was in India. That may be a bit surprising — leprosy seems to be a disease of the past. Indeed, in 2006, the World Health Organization issued a report on "elimination of leprosy as a public health problem," stating that the number of cases had dropped by 90 percent since 1985. But more than a decade later, leprosy persists. According to a report in The Lancet: Infectious Diseases, some 200,000 new cases, including 25,000 in children, are reported each year. About half of these new cases are in India. "Transmission seems to go on. The number of new cases has remained stable for the past 10 years," says Dr. Ann Aerts, head of Novartis Foundation, which is working to interrupt transmission of leprosy and eventually eliminate the disease. 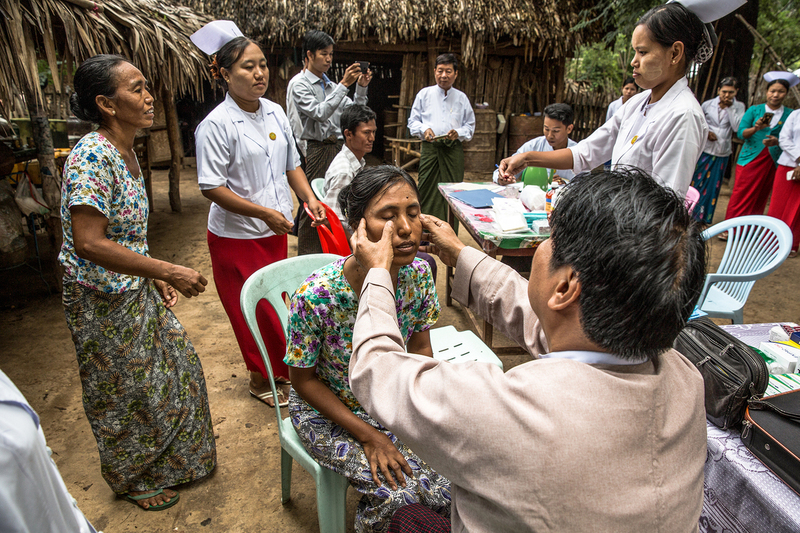 Health care workers screen women for leprosy in Nyaung U, Myanmar. However, there is no simple diagnostic test for leprosy to catch it early. Exactly how the disease is spread from one person to another isn't entirely clear, though it is not spread through casual contact, according to the Centers for Disease Control and Prevention. Scientists think it's through upper respiratory transmission — contact with nasal or oral secretion — and not just a one-time cough or sneeze from a stranger on a bus. "We do know that it's not highly contagious. You need prolonged contact with an untreated individual," says Ramanuj Lahiri, microbiologist with the U.S. Department of Health and Human Services' National Hansen's Disease Program. And, he says, 95 percent of the human population is naturally resistant to leprosy and won't catch it no matter how long they're exposed. So with transmission stubbornly continuing, do people with leprosy, also known as Hansen's disease, ever need to be thrown out of their homes, sent to leper colonies or otherwise isolated? "My answer is an emphatic 'no,' " says Lahiri. "Once [a person is] diagnosed, treatment is started and they are no longer infectious." What is especially frustrating about the new cases, Aerts says, is that the disease can be easily cured with freely available multidrug therapy when it is caught early. People don't need to suffer the consequences of the bacterial infection: nerve damage, limb deformities, amputated fingers and toes, and blindness. But there is no simple diagnostic test for leprosy to catch it early. "To diagnose it, you have to have symptoms, and a health care worker has to notice the symptoms," says Aerts. The initial symptoms are subtle — small, discolored patches of skin that have lost feeling. "Diagnosis is made with a feather or a pencil run across the skin, and the person says whether they feel it or not," says Aerts. "You may not notice it for years. And if a health care worker isn't thinking about leprosy, they won't notice it." People who have had contact with a person with leprosy are screened in Nyaung U, Myanmar. If it is discovered early, the disease is curable. But once nerve damage has set in, even if the disease is cured in the patient, the nerve damage cannot be undone. In some places, digital technology is helping with early diagnosis. Health care workers can take pictures of skin patches and send them to a regional center familiar with leprosy skin lesions for diagnosis. "We've tested and validated this method in the Philippines," says Aerts. If it is discovered early, the disease is curable. But once nerve damage has set in, even if the disease is cured in the patient, the nerve damage cannot be undone. "The lack of sensation might make you prone to injury. You tread on a nail, and it works into your foot without you even knowing it's there," says Shrubshole. "Or you burn your hands without knowing it while cooking. A lot of the injuries are caused by the wear and tear of daily life. It's a myth that fingers and toes fall off. Nothing falls off. But injuries without treatment can lead to amputation." A man who has had contact with a person with leprosy is given a preventive dose of medicine. In the 1990s, when the annual number of cases was estimated to be nearly a million a year, WHO pushed to end leprosy and set a target goal of fewer than one case per 10,000 people in a country. A lot of countries, including India, met that goal. "Various countries got below one in 10,000. They all patted themselves on the back and said, 'We've solved leprosy,' " says Shrubshole. But they still had a lot of leprosy cases in regions and pockets of various countries. "It isn't that leprosy has gone away. But people have stopped looking for it." And governments and health care organizations have switched funding from leprosy to other health needs, like malaria, AIDS or heart disease, making it what WHO calls a "neglected disease." Getting rid of the curse of leprosy will take another round of worldwide efforts, says Aerts. Researchers are looking at ways to diagnose the disease before symptoms appear. If there is one case in a family, for example, health care workers might screen relatives, looking for an early sign like a patch of discolored skin. "In those screens, sometimes we'll find patients with really, really early symptoms, and they'll get diagnosed," says Lahiri. That would get people into treatment sooner and therefore interrupt transmission of the disease. Over the past 20 years, more than 16 million people have been treated and cured of leprosy. "And the majority of those people can live happy, successful lives," says Shrubshole. But complete elimination of a disease that has been isolating, stigmatizing and incapacitating people for millennia will still take a few more years, Aerts says.